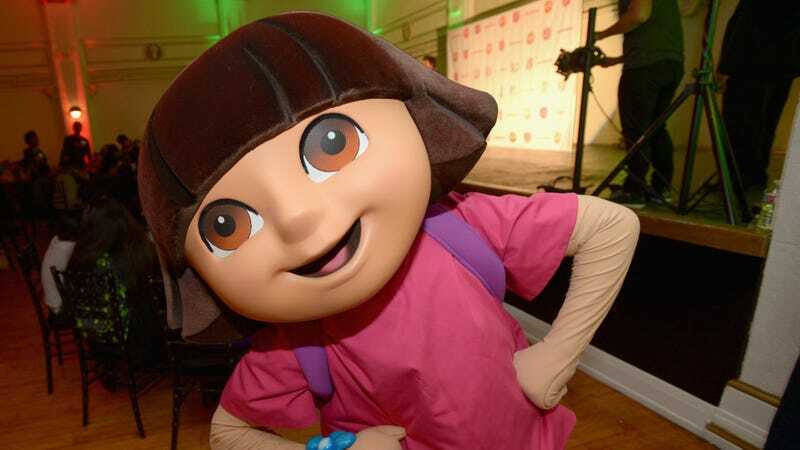 Dora the Explorer, the beloved bilingual cartoon that aired on Nickelodeon for 14 years, is heading to live-action. Obviously it will be produced by Michael Bay. Paramount Players has tapped Nick Stoller, who you know from Neighbors, Get Him to the Greek and Forgetting Sarah Marshall, to write the script. Bay, who you know from The Purge (several) Transformers (several) and, uh, Ouija, will produce. I’ve always said it’s high time more children’s shows are transformed into high-budget, explosion-heavy thrillers, so I imagine a crucial set piece will feature Dora being shot out of a volcano, and that Shia LaBeouf will co-star as a time-ravaged, muscle-bound Backpack. The original cartoon has Dora as a 7-year-old, but, perhaps given that “children” are not exactly in Stoller or Bay’s immediate wheelhouse, the new film will center on Dora as a teenager (Megan Fox? ), who moves to the city to live with her cousin, Diego (Jon Voight?? ), Deadline reports. Is the city inhabited only by clones? Is Dora a dybbuk? I would see this movie in either case. The concept for the project was initially developed in 2015, though at the time Mary Parent was on board as producer. Parent is best known for The Revenant, Pacific Rim and Godzilla, so it’s clear that the idea has always been for Dora’s explorations to take on grittier, grayer undertones than the bright colors and upbeat nature that characterize the original. Perhaps “2015" audiences weren’t ready to see Dora get mauled by a bear, but “2017" us will barely blink if Dora kills Seth Rogen and uses his corpse for warmth. We’ve seen all there is to see already. The movie will be released by Paramount Players in 2019.